Pun Pun Organic Farm near Chang Mai, Thailand, combines local culture and farming with permaculture-inspired philosophy. Photo courtesy of Andy Bustin. Growing populations and shrinking resources strain the environment and stress its human inhabitants. Developed in 1978, permaculture aims to better prepare people for an uncertain future by embracing sustainable living. At the University of Massachusetts, Amherst, dining halls serve food grown in student-started gardens on campus. Volunteers re-build areas demolished by natural disasters with eco-villages of self-sufficient solar houses. An organic farm in Thailand educates the public and shares seeds of vegetables, fruits, and medicinal herbs to empower farmers around the world. Third-world communities support themselves by harvesting water and growing food in almost uninhabitable places in Africa. Permaculture uses ethical and design principles to turn dependent consumers into responsible producers. This approach reduces waste and maximizes resources by focusing on the relationship between elements. Permaculture seeks to maximize the synergy of ecosystem, creating the whole greater than the sum of its parts. Tactics, such as harvesting rainfall, mulching, rotational grazing and strategic planting help achieve a symbiotic system. Practitioners look for ways of reinvesting surplus back into the system and recycling waste into something useful. Education and outreach efforts ensure these changes alter the “permanent culture” of the area. Check out the following case studies to see how communities around the world are re-imagining how we live and eat to promote self-sufficiency. If you want to get involved, all four organizations welcome visitors and volunteers. Franklin Street Gardens at University of Massachusetts. Photo courtesy of Keith Toffling/UMass Dining. Now, UMass has four edible, educational and biodiverse gardens on campus. With the help of over 2,500 volunteers, they planted over 2000 fruit trees, berry bushes, vegetables, flowers and herbs. UMass Dining has served almost 4,500 pounds of local, healthy produce grown in the gardens. They’ve shared their replicable, scalable and adaptable model with two local elementary schools. Their efforts have inspired universities around the country and President Barack Obama even congratulated. Earthship Visitor Center, New Mexico. Photo courtesy of Ron Guillon. Since the 1970s, Michael Reynolds has been reinventing homes according to permaculture-inspired principles. Experimentation with aluminum cans, bottles and used tires created affordable “self-sustaining vessels on land.” He devised ways to build “Earthships” in harmony with their environment, that generate their own water and electricity, conserve and reuse water, generate food and provide heating and cooling. 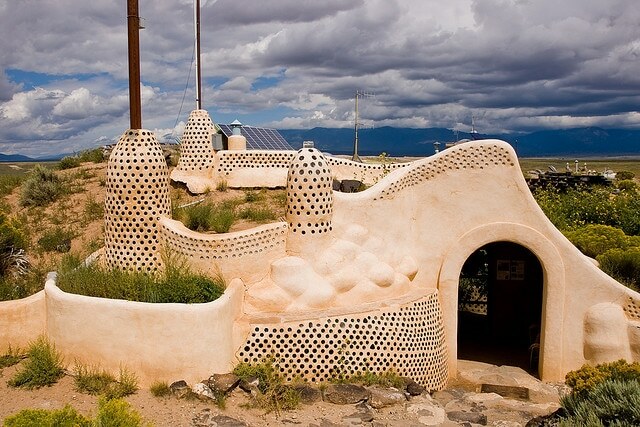 Currently, you can find Earthships in almost every state in the United States and Canada, as well as around Europe. Visitors to the mothership location in Taos, New Mexico can spend a night in one of these luxurious modern spaces, starting at $130 per night. Earthship also helps with emergency relief,Typhoon Yolanda (Haiyan). They plan to premiere their disaster-resistant “Windship” design in the Philippines. The 50,000 person eco-village will include accommodations, office space, a permanent seed bank, bunker, water catchment, indoor gardens and solar power charging capabilities. Pun Pun Organic Farm grows ingredients for their two restaurants in downtown Chiang Mai. Photo courtesy of Andy Bustin. Pun Pun “Center for Self-Reliance” is an organic farm, seed-saving operation, and living and learning center in Thailand, 50+ kilometers North of Chaing Mai in the Mao Taeng district. Ten years ago, they moved to land with completely deteriorated soil that no one wanted and changed it into a community that supports 20 people. The community lives in all earthen buildings and have used permaculture-inspired ideas and local culture to develop devolving techniques that fit the local climate and conditions. They have fruit trees, perennial edibles and medicinal herbs, vegetable gardens, chickens for eggs, and fish ponds. They save, propagate, and disperse heirloom organic seeds upon request, varieties that are now all over Thailand. Seed-saving gets seeds back in the hands of growers so that they aren’t dependent on companies and can reintroduce lost plants varieties back into our diets and culture. You can taste their local, organic cuisine at two restaurants (Pun Pun Restaurant at Wat Suan Dok and Pun Pun at Lang Moh) in downtown Chiang Mai. These restaurants help close the gap between the farmers and the consumers in the city while showing farmers that people want organic, healthy, safe food. In the living and learning center, Pun Pun offers courses throughout the year on organic gardening, earthen building, seed saving, natural health and living a more self-reliant lifestyle in Thai and English. Most people who come to our farm want to live a more sustainable life but don’t quite have the confidence to make that jump. They make their classes as simple and practical as possible and focus on teaching techniques they’ve worked with. Farming in South Africa. Photo courtesy of WWView. 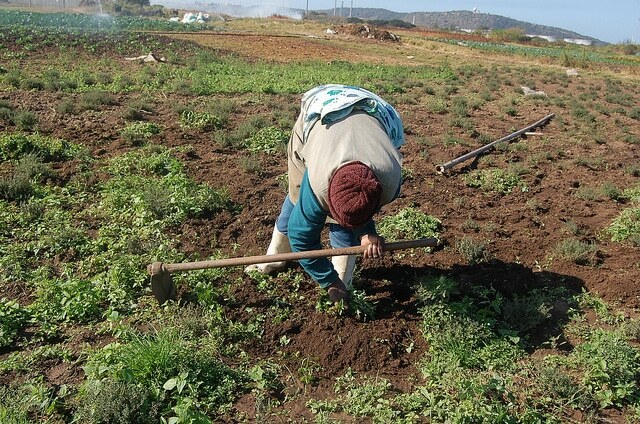 The educational eco-village of Berg-en-Dal demonstrates that permaculture can uplift dry and developing communities. The farm is located in the hills, bisected by the Kny River, at the confluence of four major bioregions. The irregular rainfall makes it a challenging place to live and thus, provides the ideal testing ground for the effectiveness of permaculture. Since 1999, Berg-en-Dal rehabilitated the degraded land using creative tilling and water harvesting techniques, planting of thicket-type vegetation and grazing management to sustain prairie growth . They cultivated the ecosystem to provide food and necessary resources for the homestead villages. The post What Is Permaculture? (And How You Can Volunteer To Help Sustainable Agriculture) appeared first on Epicure & Culture.